Minor opposition Bareun Party’s Chairwoman Rep. Lee Hye-hoon resigned from her post on Thursday over a graft scandal, 73 days after she was inaugurated. “I step down from the chairperson position today. I apologize for my carelessness amid this crisis of national security,” the three-term lawmaker said in a general party meeting. Rep. Lee is suspected of receiving cash and gifts worth about 60 million won ($53,000) from a businesswoman, in the run-up to last year’s general election. 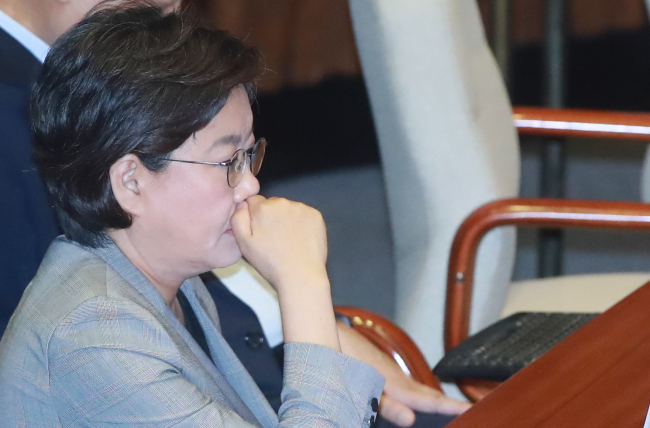 While admitting that she had borrowed money from the businesswoman surnamed Ok, Lee denied it was bribery, saying she repaid her in full a few months ago. The three-term lawmaker also claimed that the accuser appears to have approached her with hidden intentions, citing previous instances where Ok had been involved in similar cases. As she faces a prosecutorial probe, Lee said she would take legal actions against Ok.
“I pondered upon my resignation to find what would be the best for the party,” she explained. The 20-member conservative party is struggling to win support and is currently divided inside over its direction -- either to stand independent or to merge with bigger political parties. Lee had been an advocate for the party to stand on its own. Bareun Party was first established in January as the members defected from the then ruling Saenuri Party in the wake of the former President Park Geun-hye’s corruption scandal that led to her ouster. Lee stepped down 74 days after her inauguration on June 26, when she had vowed to lead a reform in the party to make it a No. 1 conservative bloc. While the successor for her position have not been decided yet, the party is likely to form an emergency party committee to lead the party until the upcoming local elections slated for June next year. For the committee chief position, political big figures such as six-term lawmaker Rep. Kim Moo-sung and Yoo Seong-min, who was previously the party’s presidential candidate, are mentioned. Lawmakers are also discussing the possibility of Floor Leader Rep. Joo Ho-young as acting chief.